Last week we reviewed the video card HIS radeon HD 4870 X2 2x1 GB and checked its performance against other graphical solutions, including the Radeon HD 4870. 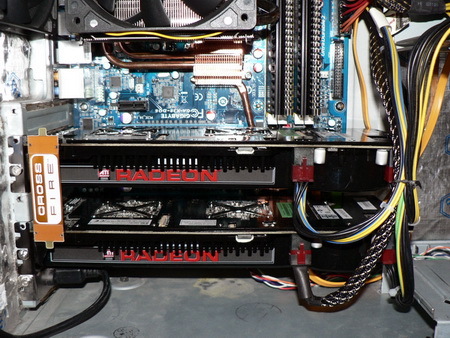 Today we will check the performance of immediately two Radeon HD 4870 X2 in CrossFireX regime and also 2XHD 4870 . According to specifications, the peak consumption of two Radeon HD 4870 X2 can be only 286 X 2 = 572 watts. 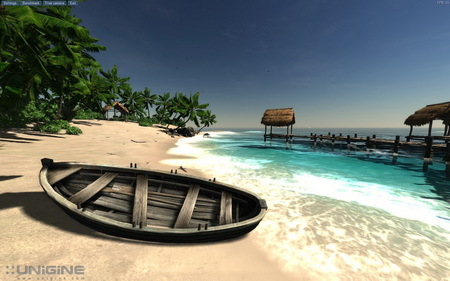 So we deal perhaps with the maximum among existing graphical solutions power. For example, Enermax galaxy DXX (EGA1000EWL) with 1000 watts peak power , when powering a CrossFireX radeon HD 4870 X2, made a high noise even higher that both video card cooler. First let us say some words about the motherboard support . We verified the work Of CrossFireX on ASUS P5K deluxe and the result was a pure failure. We do not succeed in running CrossFireX using Radeon HD 4870 and Radeon HD 4870 X2. Gigabyte GA- X 38- DQ6 (Intel x38, 16x + 16x) also proved to be incapable to work correctly with the pair of video card radeon HD 4870, since video cards always functioned in the regime PCI- E 1x. The third motherboard - DFI LANPARTY DK X48-T2RS (Intel x48, 16x + 16x) without any difficulties and hitches organized both CrossFireX configuration . Let us verify the video card energy consumption . Measurement was in 2d and also in 3d- regime (benchmark firefly forest from the synthetic test 3DMark 2006 @ 1920 X 1200 with 8xAA and 16xAF ). The peak energy consumption Of CrossFireX radeon HD 4870 X2 proved to be a little less than 800 watts!!! .After a Simple mathematical calculations (2xHD4870X2 - 1x HD4870X2) we get the energy consumption of 320 Watts!! 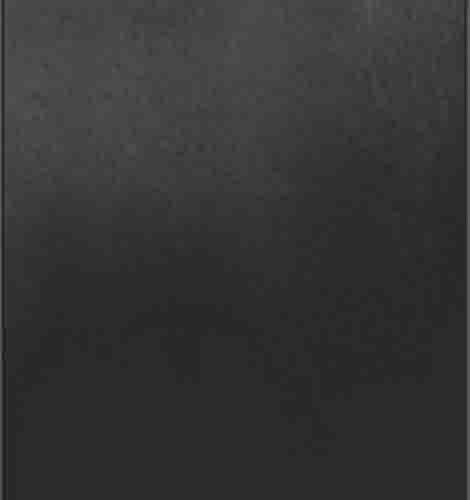 !, which do not correspond to the declared in the video card specifications 286 watts. The second note is the equality of energy consumption between the two Radeon HD 4870 and two Radeon HD 4870 X2 2d- regime. The functions of energy-economy in CrossFire regime using 2xHD4870X2 is even more effective than CrossFireX two Radeon HD 4870. Memory in this case functioned at 1006 MHz frequency , with the lowered taming 5-4- 4-12 (Performance level = 7) with 2.25 v.
Video card drivers : catalyst 8.9 beta (8.53.0). 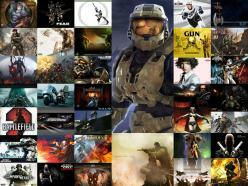 Video card are located on the charts bellow in ascending order according to their recommended cost. 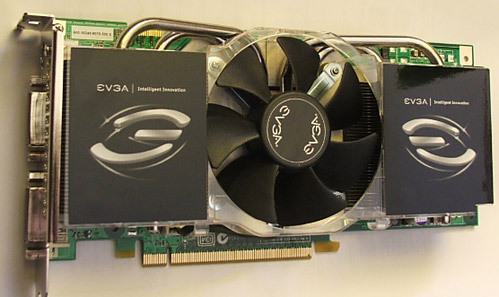 CrossFireX radeon HD 4870 X2 2x1 GB 750/3600 MHz. According to the obtained results, Radeon HD 4870 X2 in CrossFireX regime without AA and AF is limited to the central processor performance . 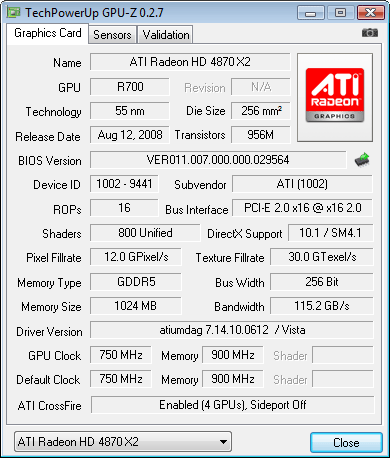 With 8XAA and 16xAF , the power of two radeon HD 4870 X2 is manifested noticeably. The HD4870 X2 is a lot faster than two Radeon HD 4870 (This is probably due to the high memory amount and the better bridge used in the dual chip card) . It is necessary to note also that the CrossFireX Radeon HD 4870 scaled well in 3DMark 2006, demonstrating an increase of + 55% and + 86% depending on the quality regime . However, concerning the default 3DMark 2006 setting (1280 X 1024, AA off, AF off) the radeon HD 4870 CrossFireX collects 22521 points, and CrossFireX radeon HD 4870 X2 23695 points (and again severely limited by the processor power). As a whole the test results in 3DMark vantage were pretty similar to the obtained earlier in 3DMark 2006. Only one difference is in the small advantage of two Radeon HD 4870 above one Radeon HD 4870 X2. 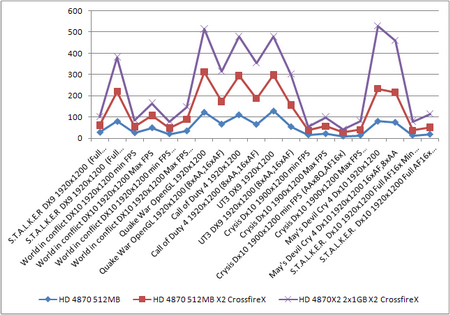 Here both CrossFireX configuration demonstrate a splendid performance scale in the comparison with single video card.. In the old S.T.A.L.K.E.R version the speed of two Radeon HD 4870 X2 is clearly limited by central processor, in comparison to one Radeon HD 4870 , the two-chip video card and the radeon HD 4870 CrossFireX demonstrate a considerable performance increase. But here. Even one Radeon HD 4870 is capable of ensuring a comfortable gaming sensations, using the maximum quality and 1920 X 1200 resolution. In World in conflict we got also the obvious speed limitation by the processor speed even at 1920 X 1200 resolution. Furthermore, the video card (HD4870) in this game is not enough in order to activate the 8x AA at 1920x1200 resolution ; therefore tests were executed with AA4x. No performance boost from crossfire was noted in this game . In Enemy territory: Quake wars we again observe a small advantage Of radeon HD 4870 CrossFireX above the Radeon HD 4870 X2. This advantage is reduced after transfer to the qualitative regime and will completely will disappear with further resolution increase . For Call Of duty 4: Modern warfare MP even a single radeon HD4870 is enough @ 1920x1200 with 16xAF and 8xAA . In order to unlock the full potential Of radeon HD 4870 X2 CrossFireX even a four core QX9650 is clearly insufficient. All video cards were smooth in the gaming process . 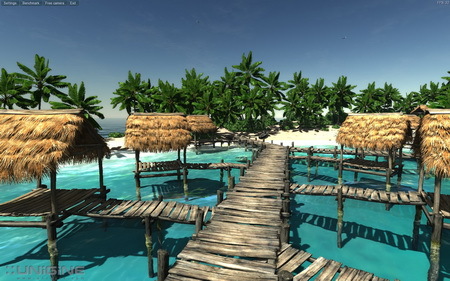 In spite of the considerable increase in the average frame -rate in both CrossFireX configuration, the minimum FPS is lower than on one Radeon HD 4870 X2, So here one Radeon HD 4870 X2 is the best selection for Crysis game . In May\'s Devil Cry 4 regime , Radeon HD 4870 X2 CrossFireX show an outstanding effectiveness and demonstrates a high performance and superiority over other configurations. Increase in comparison with the single two-chip video card composed +92~ 95% depending on the quality regime . Splendid CrossFireX and a considerable performance increase in comparison with the single configuration . 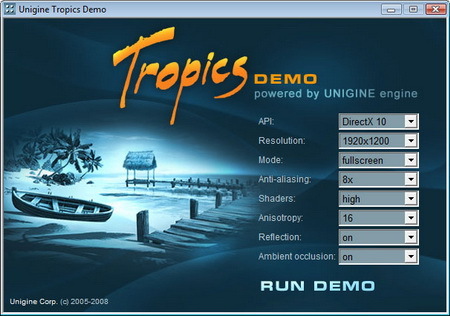 In turn, the CrossFireX Radeon HD 4870X2 was the only configuration able to play this game comfortability at 1920x1200 resolution . In terms of average value on all tests the radeon HD 4870 X2 works at 99.3% in comparison with radeon HD 4870 2x512 Mb CrossFireX. But in this case we deal with the pure speed regime no AA or AF . 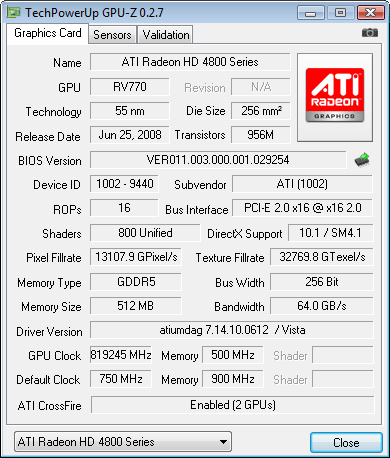 Now with anisotropic filtration, the Radeon HD 4870 X2 demonstrate 102.7% of performance . 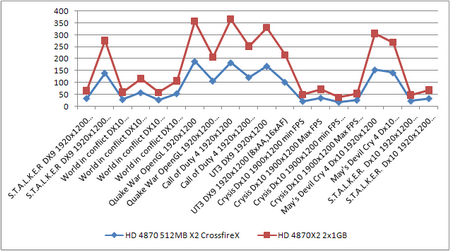 Note here the HD4870x2 Crossfire performance is in 99% of case limited by the processsor performance . Note our used processor was the four core QX9650 overclocked to 4 ghz !!!!! The question of selection between radeon HD 4870 2 x 512 Mb CrossFireX and one Radeon HD 4870 X2 2 x 1Gb is clear now. The selection should be in favor Of radeon HD 4870 X2 . First, Not all motherboard are coupled with Full high speed PCI- E ports , even some motherboards (which advertise CrossFireX support with 16X) can\'t function correctly with such configuration . 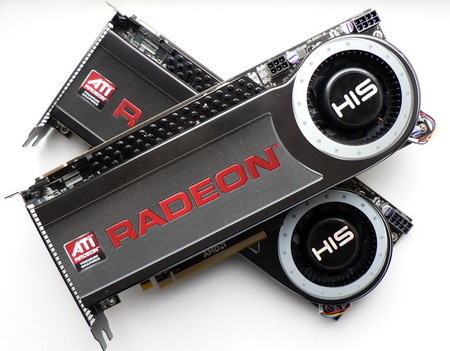 The cost of two radeon HD 4870 is today higher than one Radeon HD 4870 X2. 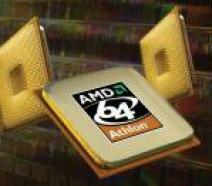 Moreover we note also the higher energy consumption in IDLE regime for the pair radeon HD 4870 in CrossFireX. Speaking now about Radeon HD 4870 X2 2 x 1Gb CrossFireX , first , besides the high cost of those card , they require a powerful power unit with at least 850 watts and above. 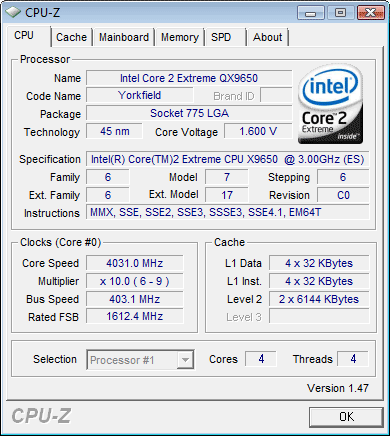 Second : the performance is usually limited by the processor . Today the overclocked processors ( by ~34% ) Intel core 2 Quad QX9650 was insufficient for the complete satisfaction of radeon HD 4870 X2 CrossFireX appetites even in the qualitative regimes (with AA and AF). 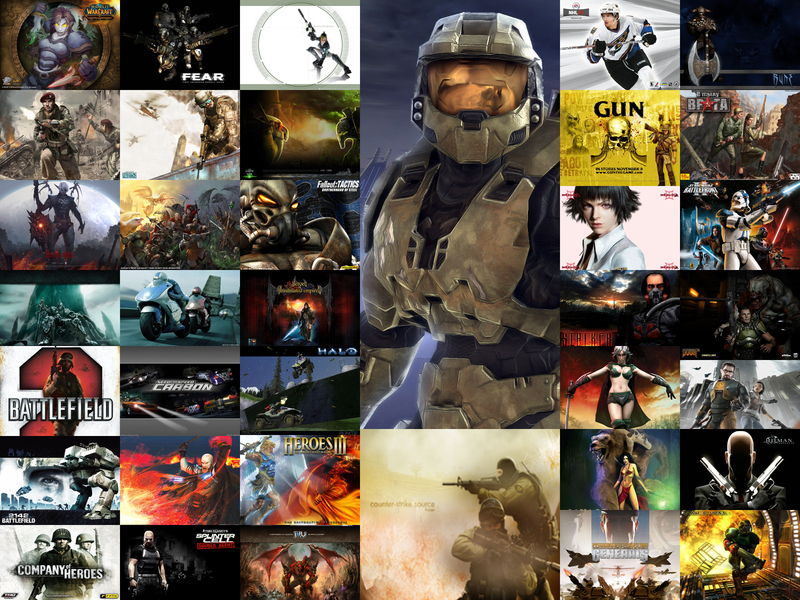 The only exception are Crysis and S.T.A.L.K.E.R. 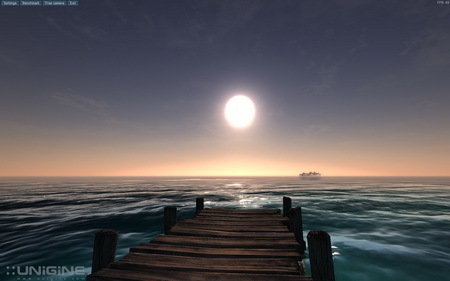 : Clear sky.